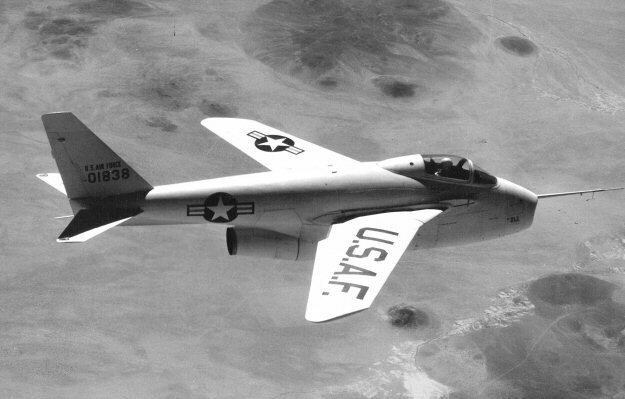 On this day in 1951 the Bell X-5 had its first flight. Inspired by the untested P.1101 design of the German Messerschmitt, the Bell X-5 was the first variable-geometry design aircraft and, unlike the Messerschmitt which could only have its sweep angle adjusted on the ground, the Bell engineers created a system of motors to adjust the sweep in flight. The Bell X-5 could had three sweep angles to its wings (20, 40 and 60 degrees), with a jackscrew controlling the angle and disc brakes locking the wing into position in flight. The articulation of the pivot partially compensated for the shifts in the centers of gravity and pressure as they moved but even with this feature the X-5 had a flawed aerodynamic layout due in large part to the position to the tail and vertical stabilizer. In some wing positions it could cause an irrecoverable spin and it was this spin that caused the destruction of the second aircraft and the death of its pilot, Captain Ray Popson, on October 14, 1953. There were two Bell X-5’s built and between the two aircraft there were almost 200 flights made. The X-5 demonstrated the advantage of swept-wing aircraft and proved concepts that were eventually used in the F-111, F-14, MiG-23, Panavia Tornado and the B-1 Lancer. The Bell X-5 was retired in December 1958 and the surviving aircraft is on display at the excellent National Museum Of The United States Air Force at Wright-Patterson Air Force Base in Dayton, Ohio. Did you have a question I can answer for you about this? I am truly glad to glance at this webpage posts which includes tons of valuable data, thanks for providing such information.